Come explore the rapidly growing and creative field of Entertainment Technology! Create your future by engaging in hands-on real world experiences in this progressive and growing industry. At Palm Springs Middle School you will have the opportunity to grow academically in a nurturing environment while exploring your creative genius in various magnet courses. Come be a part of something special and create your future! 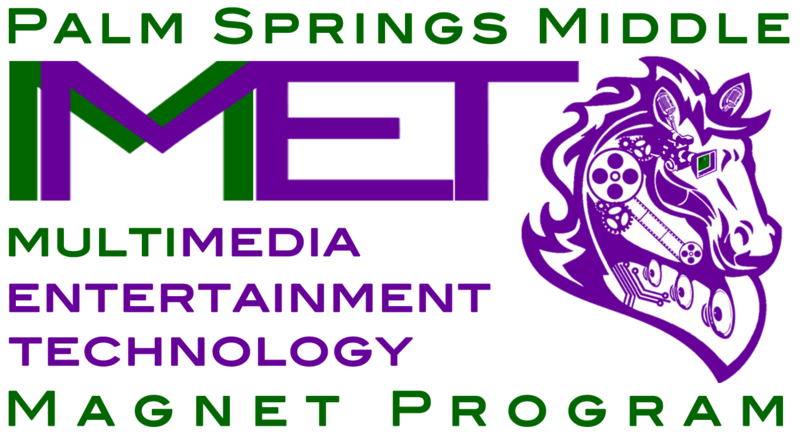 Enroll in the MET Magnet and prepare for success in the diverse digital world of the entertainment industry. Gain experience in the fields of sound engineering, T.V. and film production, digital design and emerging technologies that help to create our digital future. Create state-of-the-art work using industry standard applications that enable you to express your individual creativity and collaborate with your instructors in creating over the top productions. Explore the business side of the industry and develop our entrepreneurial skills while enjoying success on your career path to college. Spark your artistic passion as a member of our creative magnet program! There is no decision more important to a child’s success than that of the school the student chooses to attend. The MET Magnet will prepare students with the skills necessary to pursue other educational opportunities throughout Miami-Dade County Public Schools’ Magnet Programs. We are committed to assuring that your child receives a well-rounded education that prepares him/her for whatever career path he/she may choose.